The club was formed under the name DEREHAM FC in 1884 and have been known as EAST DEREHAM and DEREHAM HOBBIES at various points during their history. They settled on their current name in 1991. 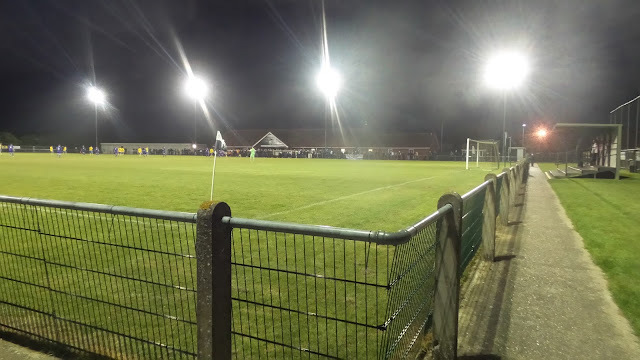 At the time they were playing in the Anglian Combination, having previously competed in its forerunner - the Norfolk & Suffolk League and the Dereham & District League. 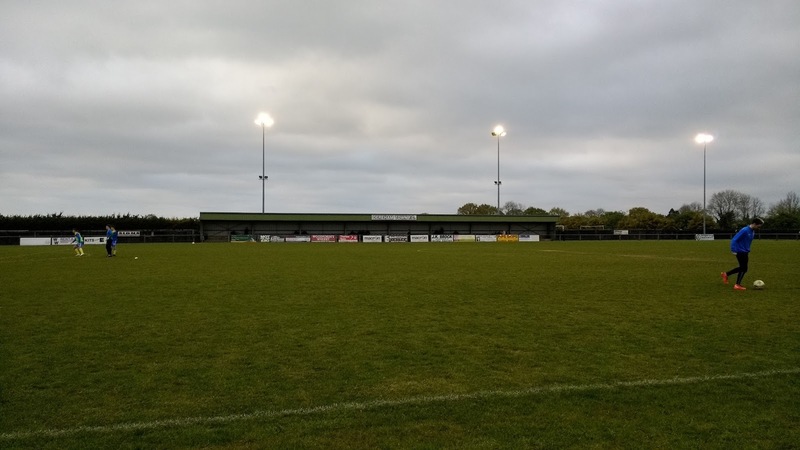 The 1997/98 season saw them crowned Premier Division champions and for the following season, they were promoted into the Eastern Counties League. 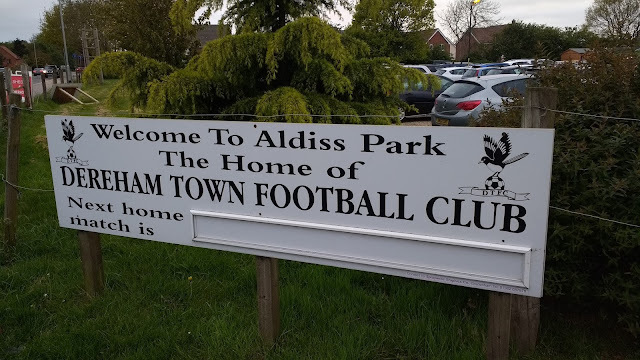 Starting out in Division 1, they started with two solid 7th placed finishes before a runners-up spot behind Swaffham Town in 2001 was good enough to see them promoted to the Premier Division. Bottom half finishes were the order of the day in their first 5 seasons and they flirted with relegation on more than one occasion. 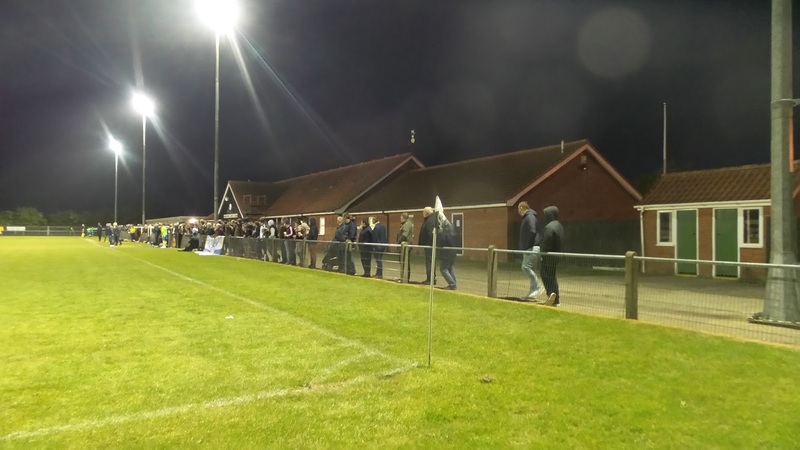 However, things soon improved and after finishing as runners-up to Leiston in 2011, they were champions a couple of years later, earning promotion to the Isthmian League D1 North. They've been there ever since, with the best finish coming in their first two seasons when 7th place was achieved. The current season has seen results tail off a bit, with them finishing in 18th, but well clear of relegation. Since their promotion to the Isthmian League, they've fielded a reserve side in the Eastern Counties League, with a best ever finish of 13th in 2014 for a side mainly comprising of youngsters in between the youth and first teams. 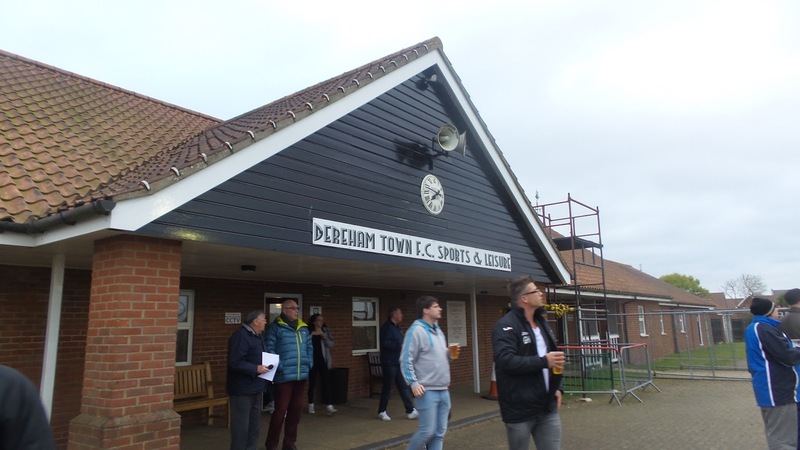 In the FA Cup, Dereham's best progress came in 2012 when they reached the 3rd Qualifying Round before losing in a replay to Metropolitan Police. 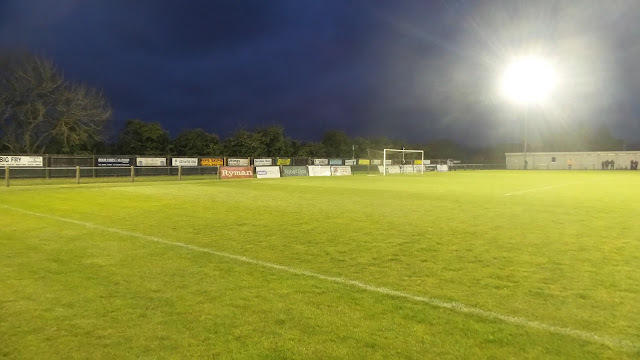 In the FA Trophy, they reached the 2nd Qualifying Round in 2014 before going out to Sholing. 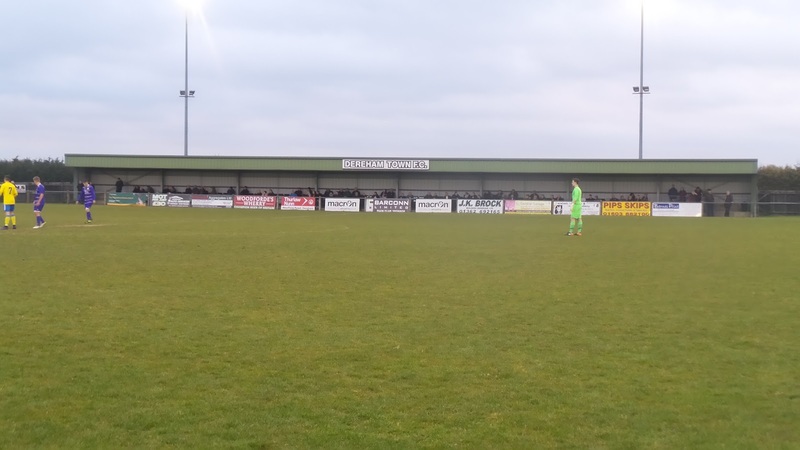 In the FA Vase, the 5th Round was reached in 2008/09 where they lost to fellow league opponents, Needham Market. 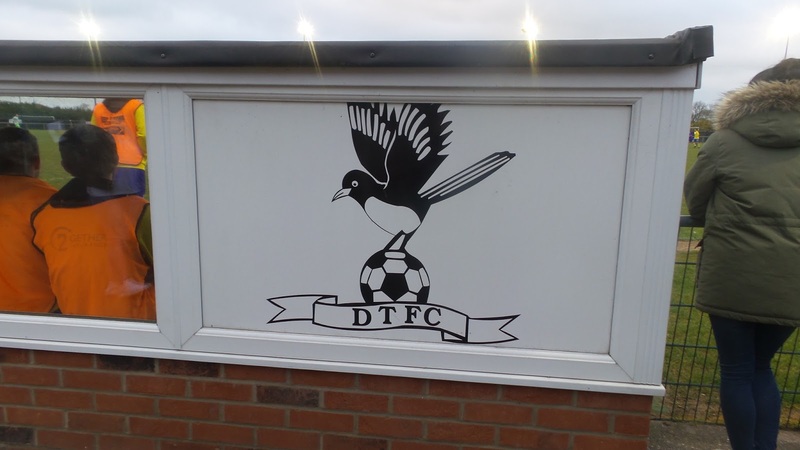 Local honours include the Dan Frost Memorial Cup in 1998, the Anglian League Cup in 1994 and the Norfolk Senior Cup on four occasions. The club's record crowd came in 2001 when 3000 saw their pre-season game against Norwich City. The town of Dereham has been occupied since the Bronze Age, with tools following digging found in fields during the 1980's. Dereham was home to the Jentique factory, which manufactured boxes for instruments & bombs during World War 2. Notable people from the town include author Brian Aldiss, with the football club's ground named in his honour. Comedian Steven Fry also married his partner in the town during the summer of 2015. 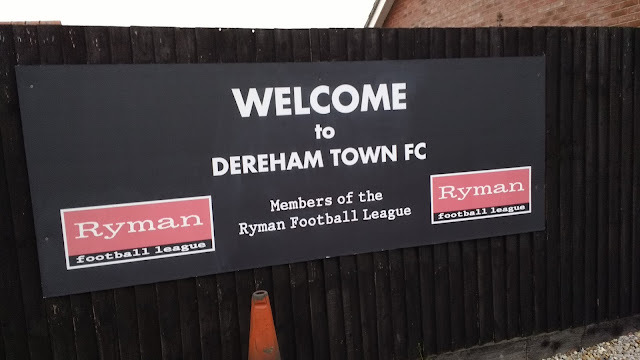 Despite semi-regular Friday night games in the Eastern Counties League, Dereham had not yet come up as an option when I was available. I'd 'ticked' several in this league with my Braintree supporting pals, with it being a handy option if I wanted to pass through Essex. I was glad when another hopping pal, Chris, decided he fancied this, despite his usual disdain for visiting grounds other than when the occupant's first team are at home, decided he fancied some Friday night football. 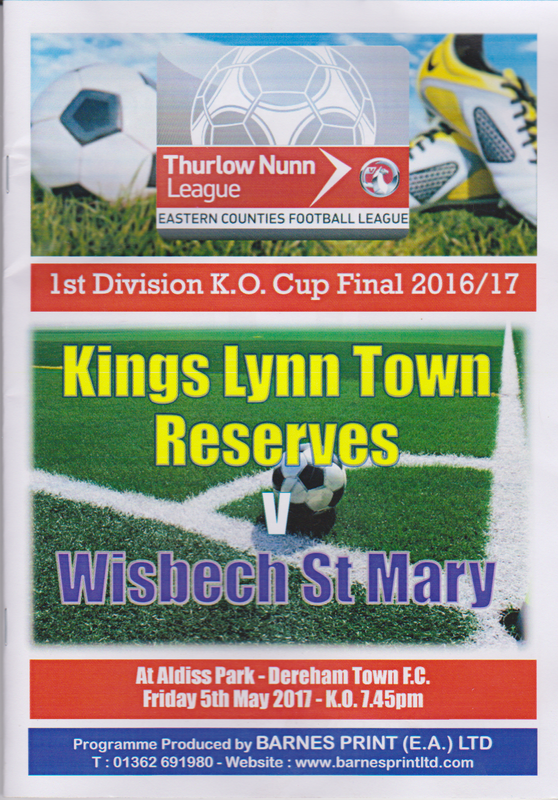 It was to be the Eastern Counties League Division 1 Knockout Cup Final between Wisbech St Mary & Kings Lynn Town. 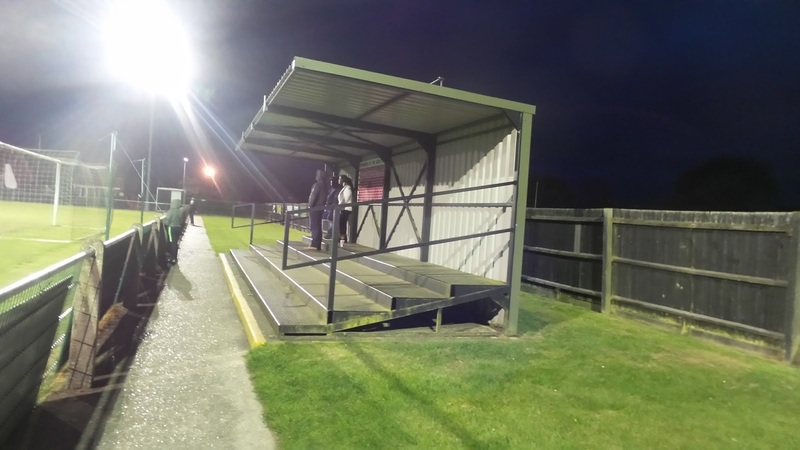 Wisbech started in the first round with tonight's hosts Dereham Town beaten 2-1. They then ca,e away from Diss Town with a 4-1 victory before a 2-1 victory against Framlingham Town set up a semi-final clash with Coggeshall Town whom they beat 2-1. 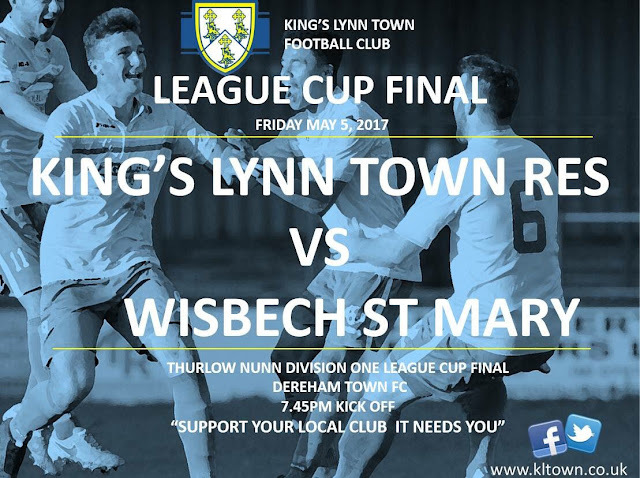 Kings Lynn Town got a bye to the second round where they beat March Town United 4-0. Whitton United were beaten 3-0 in the Quarter Final before a 2-0 semi-final win over Team Bury set up tonight's final. On the day of the game, it was a brutally busy day at work, not helped by the lack of equipment, staff and supervisors that pull their weight. As a result, I didn't get away until 3 PM and it was all a bit of a rush with me getting home at 3.25, getting changed and catching up on things before setting off for Milton Keynes half an hour later. The roads were a little busier than usual around Aylesbury, but even so, I was there to meet Chris just after 5. Fortunately, the roads were well behaved and we were at our pre-match meal stop at Swaffham. We'd visited the Hong Kong House Chinese takeaway when visiting Swaffham Town earlier this season and it had been one of the best that I'd been to. Again it didn't disappoint, and my chicken satay skewers and salt & chilli chips were delicious. From there we made our way to the ground, the journey taking a slightly longer than planned 25 minutes, owing to an accident closing the A47. For once it was well managed, with my sat-nav working out an alternative way. Hopefully, no one was too seriously hurt. We got to the ground at 7.30 and were directed to a parking space by helpful stewards. After getting pictures of the outside of the ground, we went in, paying £5 entry plus £1 for a decent programme. First stop was the bar for a pint of Aspalls which was nicely chilled and well kept. As it was in a plastic glass, I was able to take it out pitchside to watch the game. It started fairly slowly, but King's Lynn's young reserve side were the better team. The only goal of the game came on 40 minutes and it was a stunning strike by Kyran Stannard from 30 yards that gave King's Lynn the lead and ultimately the game. At half time, I went and got some chips. Due to a bigger than anticipated crowd, the tea bar was overwhelmed and as a result, I had to wait 20 minutes for my food. 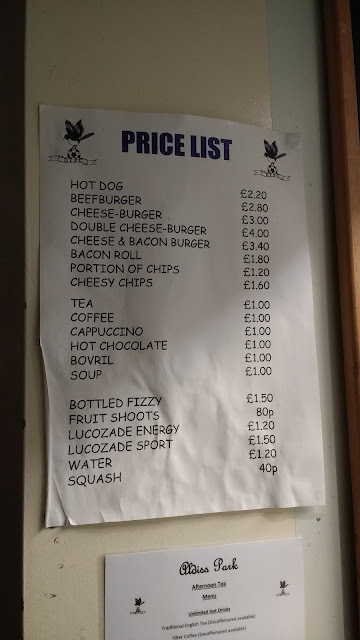 At least when it came it was freshly cooked, tasty and great value at £1.20 a portion. The second half started in the same lethargic fashion as the first had ended. The last 20 minutes of the game were a little better with Wisbech St Mary crashed a shot against the bar. Generally, their shots were wayward too and during a rare but correct free kick awarded against them for a pass back they had a couple of players booked for dissent but the free kick for King's Lynn came to nothing. I was keen to get away after the game, as I wanted to visit Morrisons before it closed at 10. The only problem was, I was trapped in due to us being parked tightly together. Any one of around seven cars could have moved and I'd have been fine, but they were all inside watching the cup being presented. I had to wait 15 minutes for everyone to emerge, but luckily I made the supermarket with 5 minutes to spare. The reason for this mercy mission? A box of Morrison's vintage cider that had been out of stock for weeks in the Wycombe store. It was one that I had yet to try and luckily there was plenty in deepest Norfolk. I got that along with a couple of bottles of Irn Bru before topping up my car with fuel and leaving at 10.15. There was little traffic around at this time of night and the Two Mikes podcast kept myself and Chris company as we headed home. I dropped him off around midnight getting home myself at 12.45. A couple of pints of cider were consumed whilst I watched TV and wrote up my blog, With tomorrow's Wycombe v Cambridge game not kicking off until 5.30, there was no rush for me to get to sleep and so it was a fairly late one for me. 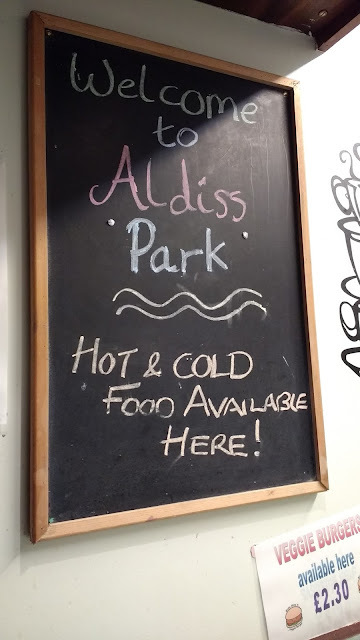 ALDISS PARK is a well-appointed venue, just off the A47 and around a mile from the town. As a result, there is not a huge amount in the immediate vicinity of the ground, but there are a few places en route to the town. The facilities at the ground are decent though. The bar does Aspall cider which is a pretty decent one if all a little too common in these parts. There are various other choices on draught as well as bottled ales from a local brewery. 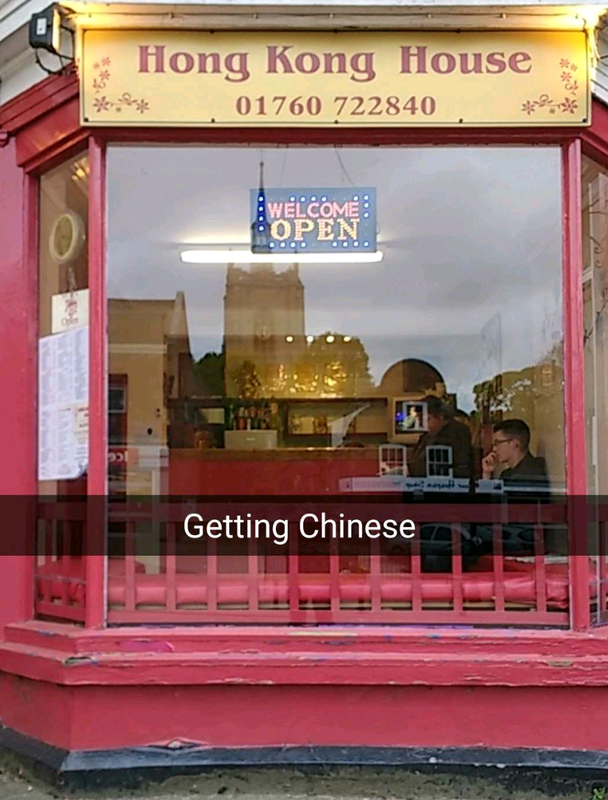 The food choice is decent and tasty, although you may have a bit of a wait if it's busy. As for the ground, it's mainly open with a smart main stand and a small area of 'Arena' standing behind one goal. Total capacity is 2500, with covered seating for 150 and covered standing for 125.